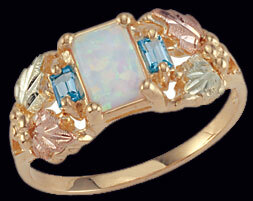 Black Hills Gold Opal ring by Landstrom's Black Hills Gold. A brilliant lab opal accented by two tasteful, marquis cut Swiss blue topaz stones. Available in sizes 4 - 11. Usually ships in 3 - 4 business days.